F Danis Zaripov (Swift Current, 1998-99) has been suspended by the IIHF until May 22, 2019, for using illegal substances. One of Zaripov's samples tested positive for banned stimulants, as well as substances prohibited as diuretics and masking agents. Multiple sources have said Zaripov will appeal. There is no comment so far from the IIHF, KHL or his team, Ak Bars Kazan (Russia, KHL). . . . Patrick Conway of Conway’s Russian Hockey Blog has more right here. . . .
D Tomáš Voráček (Prince Albert, 2007-09) has signed a tryout contract with Slovan Bratislava (Slovakia, KHL). Last season, he had two goals and three assists in 43 games with Mladá Boleslav (Czech Republic, Extraliga). . . .
F Matt Fraser (Red Deer, Kootenay, 2006-11) has signed a one-year contract with Dornbirn (Austria, Erste Bank Liga). Last season, he was pointless in four games with Rögle Ängelholm (Sweden, SHL). Fraser was sidelined by injury until Feb. 28. If they haven’t already, landlords to WHL teams just might be hearing from their tenants one of these days. It seems that the league and its teams are concerned about flat ticket sales and are looking for some relief. 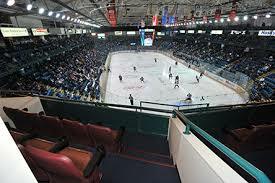 Sandman Centre, home of the Kamloops Blazers. The City of Kamloops has revealed that it approved a new 10-year lease for the Blazers in February, one that cut the rent by about $150,000 per season. Jeff Putnam, the city’s parks and civic facilities manager, told Andrea Klassen of Kamloops This Week that the WHL and its teams have been working to renegotiate leases. Klassen reported that the Blazers, whose lease was to expire in 2018, will pay a base rental fee of $128,000 to use the Sandman Centre for 2017-18, down from $278,000 in 2016-17. Last season, the Blazers’ announced average attendance was 3,782 for 36 regular-season home games. However, there frequently were far fewer bums in the seats than the announced figure, meaning there were a lot of no-shows. The Blazers also pay the city $250,000 per season in exchange for all advertising rights in the arena. The vote on the new lease passed by a 5-3 vote among councillors. “I have to admit, I had a little bit of trouble swallowing somebody coming to me with their hands out and they’re a billionaire,” Dieter Dudy, one of the councillors who voted for the agreement, told Klassen. Gaglardi also owns the NHL’s Dallas Stars. He is the CEO of the Northland Properties Group, which owns, among other things, the Sandman and Sutton Place hotels, as well as Denny’s and Moxie’s restaurants, and Shark clubs. Gaglardi and four ex-Blazers — Shane Doan, Jarome Iginla, Mark Recchi and Darryl Sydor — purchased the franchise from the Kamloops Blazers Sports Society, a community group, in 2007. Meanwhile, according to hockeyzoneplus.com, a site that tracks the earnings of NHL players, Recchi made US$50,943,000 during his playing days, while Sydor brought in $31,715,000. Both men have retired from playing. Doan’s career earnings are at $41,294,000, with Iginla at $69,025,000. Doan and Iginla, both of whom played last season, are unrestricted free agents who have yet to sign new contracts. Dudy told Klassen that he voted in favour of the new lease because of concerns that the Blazers might leave Kamloops. However, under the terms of the sales agreement between Gaglardi’s group and the society, the society has the first option on purchasing the franchise should ownership wish to sell it or move it. In other words, the Blazers aren’t going anywhere. Besides where would they go? Yes, there is an empty arena in Abbotsford, one that seats 7,000 for hockey, but the Vancouver Giants, who play out of Langley, would have a move and that isn’t likely to happen. According to Smillie, the society felt holding that option was important even though Gaglardi’s group promised to keep the team in Kamloops. that WHL bylaws don’t contain anything guaranteeing the franchise could not be moved. Kamloops taxpayers also are on the hook for more than $1 million in upgrades to the arena, all of them at the request of the WHL. That includes $300,000 to improve lighting — the WHL has requested that all arenas have LED lightning to facilitate HD telecasts — and about $1 million to retrofit boards and glass. Two former WHL coaches will be part of the Team Canada’s coaching staff at the 2018 Olympic Winter Games in Pyeongchang, South Korea. . . . Willie Desjardins, a former head coach of the Medicine Hat Tigers (2002-10), will be Canada’s head coach, while Dave King, who coached the WHL’s Billings Bighorns (1977-79), will be one of the assistant coaches. . . . The NHL has opted out of the Games, so Hockey Canada will put together a national team of players from outside that league. Its schedule begins with a tournament in Sochi, Russia, from Aug. 6-9. Canada then will move on to St. Petersburg, Russia, for another tournament, Aug. 14-17. . . . Team Canada’s roster for the Sochi Cup includes a number of former WHL players, including F Gilbert Brule (Neftekhimik Nizhnekamsk, KHL), F Bud Holloway (Skellefteå AIK, SHL), F Rob Klinkhammer (Dinamo Minsk, KHL), F Brandon Kozun (Lokomotiv Yaroslavl, KHL), F Ben Maxwell (Spartak Moskva, KHL), F Brandon McMillan (Dinamo Riga, KHL) and F Linden Vey (Barys Astana, KHL). Taking Note has been told that the Kootenay Ice has dropped all of its part-time scouts, choosing to keep only Garnet Kazuik, the director of scouting. Kazuik, a former WHL player, has been with the Ice for 12 seasons, 10 of them as director of scouting. . . . Matt Cockell, the Ice’s president and general manager, apparently told the ex-scouts that he is changing the business model and is moving to a system that employs three full-time scouts in Western Canada. . . . The WHL’s 2016-17 Guide showed the Ice with eight scouts — Wayne Dougherty, Peter Dubbeldam, Ward Edwards, Scott Frizzell, Chad Harden, Zenon Herasymiuk, Scott Perry and Tim Schick. Taking Note has been told by a source familiar with the situation that “all eight part-time scouts were let go.” . . . Cockell hasn’t responded to a request asking if he had made changes in the scouting department. Alta., played in 55 games with Edmonton last season, going 19-31-3, 3.86, .882. 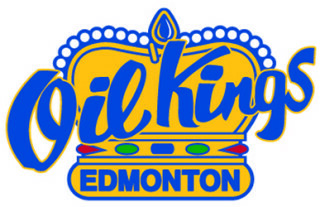 In 123 career regular-season games, he is 48-55-8, 3.34, .890. . . . Dea was a first-round selection by Edmonton in the WHL’s 2012 bantam draft. . . . With Dea’s departure, the Oil Kings appear poised to start the season with Travis Child as their No. 1 guy. He was acquired from the Brandon Wheat Kings on May 30, for a conditional fifth-round pick in the 2018 bantam draft. Child, 20, played two-plus seasons with the Swift Current Broncos before being traded to Brandon last season. . . . Chances are that Boston Bilous, 16, is No. 2 on the Edmonton depth chart. From Langley, B.C., he was a fourth-round pick by the Oil Kings in the 2016 bantam draft. He spent last season with the Fraser Valley Thunderbirds of the B.C. Major Midget Hockey League. He finished with a 2.20 GAA. G Jeffrey Veitch, who will turn 20 on Oct. 4, has signed with the Waldorf University Warriors, who play out of Forest City, Iowa. Veitch was an eighth-round selection by the Kootenay Ice in the eighth round of the WHL’s 2012 bantam draft. He played last season with the Kirkland Lake Gold Miners and Timmins Rock of the Northern Ontario Junior Hockey League. Before that, he played three seasons with the junior B Mission Outlaws. He is from Mission, B.C. The Saskatchewan Hockey Hall of Fame held its gala night on Saturday in North Battleford and there were a number of inductees with ties to the WHL, including Bob Bourne, Stan Dunn, Graham Tuer and Ken Wheler. . . . John Cairns of the Battlefords News Optimist has a terrific recap right here. Meanwhile, on Sunday night in Canmore, the Alberta Hockey Hall of Fame held its induction dinner, with the hall doors swinging open for Mel Davidson, Bill Hay, Tony Kollman, Perry Pearn, Glen Sather and the Sutter family — yes, the entire family. . . . There is more right here. Yes, I was on the air with Jason Gregor and Jason Strudwick of TSN1260 in Edmonton on Tuesday afternoon. If you missed it, you can find the conversation — it was about 20 minutes worth — via the above Tweet. And thanks to all of you who messaged me afterwards. The kind words are much appreciated. “Of the 202 players, 111 of them played in the N.F.L. — and 110 of those were found to have chronic traumatic encephalopathy, or C.T.E., the degenerative disease believed to be caused by repeated blows to the head. The full report from The Times is right here, and it’s well worth a look. This should end, once and for all, the debate about whether blows to the head are responsible for CTE. A person needn’t have been concussed in order to end up with CTE; it’s quite simple -- blows to the head aren’t a good thing. Period. This also should be enough for the powers-that-be in any hockey league that allows fighting to act to get it out of the game. The OHL’s Saginaw Spirit is looking for a head coach after Spencer Carbery left to join an unnamed AHL team as an assistant coach. The 35-year-old Carbery, who is from Victoria, spent one season with the Spirit, after working for five seasons as director of hockey operations and head coach of the ECHL’s South Carolina Stingrays, who have an affiliation with the NHL’s Washington Capitals. . . . Last season, the Spirit finished 27-32-9 and out of the playoffs. David Bell has joined the AHL’s Ontario Reign as an assistant coach. Bell, 40, spent the previous four seasons with the OHL’s Niagara IceDogs, three as an assistant coach and last season as head coach. . . . With the Reign, Bell will work alongside head coach Mike Stothers. They spent three seasons (2004-07) together with the OHL’s Owen Sound Attack, Stothers as head coach and Bell as an assistant. . . . Bell has previous AHL coaching experience having worked as an assistant for two seasons (2007-09) with the Springfield Falcons. If you’re wondering, @clouston25 is the Twitter handle for former WHL D Connor Clouston, whose father is Shaun Clouston, the GM and head coach of the Medicine Hat Tigers.